Green Roofing Resources: Environmentally sound and sustainable roof construction represents the future of the industry. Businesses increasingly look for value not only in materials, but also in energy efficiency and low environmental impact. We deliver a variety of roofing solutions that meet our customers environmentally conscious standards. From long-lasting, economical EPDM, to our SolarShield white rubber, a durable waterproof membrane is the foundation for any green roof. Lottes Roofing is committed to assisting our customers with all their green roofing needs..
EPDM Rubber remains one of the most sustainable roofing materials in use today. 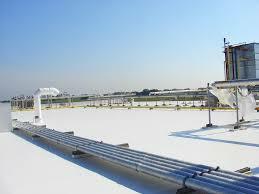 Life cycle costs are are low, making EPDM an excellent economic value. Additionally, less frequent replacement reduces environmental impact and limits disruption to business. We offer a wide selection of EPDM Rubber and accessories. Our SolarShield White EPDM Membrane provides increased reflectivity, allowing customers to conserve energy and realize additional savings. 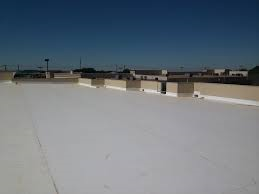 An Eco-friendly roofing product and as easy to install as traditional EPDM. And SolarShield helps businesses meet their LEED points goals. Contact us for additional information. Our Latex Bonding Adhesive uses a stable, environmentally sound composition. Providing professional strength adhesion and minimum toxicity, this Latex adhexive is a safe and economic alternative to other bonding agents. Easy to apply and without the risk of contamination to the surrounding environment. Roof gardens, or “living roofs,” are an increasingly attractive proposition. Emerging green roof technologies not only provide the owners with a solid return on investment, they also create significant social, economic and environmental benefits, particularly in cities. Green roofs reduce heat generation, manage storm water runoff, provide new economic benefits through use of additional valuable space, create year-round energy efficiency and possibly qualify the building’s owners for LEED points. With rising energy costs, reflective roofing materials or green roofs can dramatically reduce energy consumption. In fact, one study showed a 26% reduction in summer cooling needs and a 26% reduction in winter heat losses for green roofs. According to Penn State University’s Green Roof Research Center, a properly installed green roofing system can double or even triple the lifespan of the underlying membrane, offsetting the associated costs. Among other benefits a Green Roof helps to stabilize the temperature inside the building. Soil and vegetation absorb the worst of the heat during the day, cooling the building underneath, while daytime heat is retained after sunset, keeping the building warm at night. As with any high-performance roofing system, garden roofs require careful planning and the use of quality materials, including EPDM membrane. Ecostar Roofing Tiles are made of up to 80% recycled post-industrial rubber and plastic. EcoStar tiles prevents these materials from ending up in landfills. Because of their recycled content, EcoStar roofing tiles feature incredible strength and flexibility and provide long-lasting performance. The use of EcoStar products also preserves natural resources, as no trees are used and no stones are quarried in the production of EcoStar’s Tiles. Because of their eco-friendly efficiency, EcoStar products can significantly contribute toward LEED credit requirements. Recycling of roofing materials ensures minimal environmental impact. Recently, manufacturers have partnered with environmental groups to developing recycling programs for reclaimed EPDM. With 40% of total landfill waste coming from construction debris, recycling programs helps to ensure EPDM’s sustainability in the years to come. Also, proper management of waste from construction can earn LEED points. 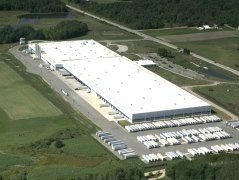 With more than 20 billion square feet of EPDM roofing installed, recycling programs continue to expand, and we support these efforts. For your Rubber Roofing Order Tracking, shipping and freight information, please EMAIL US. We only offer support to OUR customers concerning OUR products.